It’s round two for Superman and the Red Cloud in Action Comics #1006, by writer Brian Michael Bendis, artist Ryan Sook, colorist Brad Anderson, and letterer Josh Reed. This book has been in a tailspin the last few issues and this issue is a bit of a course correction, but is it enough to save this story arc? Clark Kent questions the mayor of Metropolis about his decision to pull funds for investigating the recent spat of arsons. He’s told off by the mayor’s entourage, but uses his super hearing to get confirmation of what mayor said and find out that the mayor is working with someone and that deputy fire chief Melody Moore could be in danger. The Red Cloud attacks Moore and Superman is able to fight her off. The Red Cloud, in her civilian identity of Robinson Goode, goes to the Invisible Mafia’s headquarters and is introduced to the boss, who reveals she’s made a purchase that could change everything. 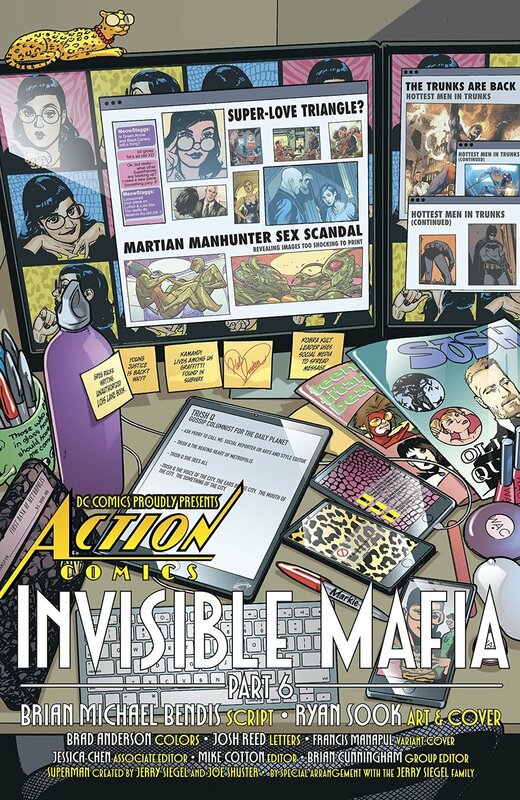 The Invisible Mafia was an intriguing idea when Bendis started his run, but as the issues went on, he started focusing on so many other things that the idea has lost its luster. From his original characters to the anticlimax of Lois’ return to last issue’s rather blatant advertisement for the upcoming Dial H For H.E.R.O book from his own Wonder Comics imprint, Bendis has filled this book with way too much and lost track of the main story multiple times. However, this issue is tight ,well paced, and gets back to that main plot thread. Bendis moves it forward in a satisfying way, though there are some missteps; a scene where Clark goes back to the Daily Planet after confronting the mayor kind of goes nowhere and the reveal of the Invisible Mafia’s boss seems like it’s going to be a big deal until it’s actually revealed, but it could be a lot worse. The real problem with this issue is the legacy of all the weird and sometimes bad storytelling decisions Bendis has made up until this point. Six issues into the story and this comic represents the first time the main plot has really moved forward at all. Revealing the mayor is corrupt and working with the Invisible Mafia is a nice step, but it’s three issues too late. There’s been so much filler up to this point that it loses a lot of impact. 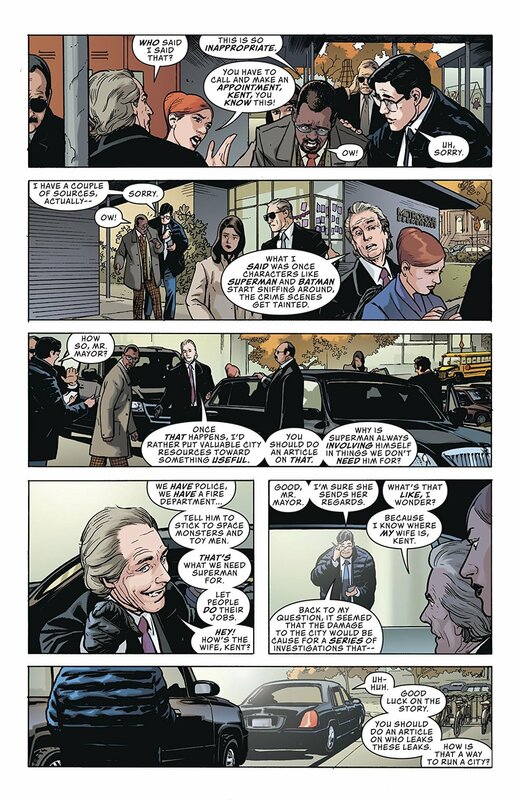 Instead of revealing the mayor to be a shady character quickly, Bendis crammed in more pointless drama and spot lighted his original characters. Decisions like that taint this issue and it’s a shame. If Bendis had set out to write this book more in line with this issue, Action Comic would be a much better book. One thing about the book that isn’t a disappointment is Ryan Sook’s art. This man should have been drawing a Superman years ago. His linework is crisp and clean and his detail is phenomenal. He’s able to take anything Bendis throws at him and make it look good, even if the material itself is wanting. It’s almost worth it just to read the book for his art alone. He takes the Daily Planet scene, one where nothing special happens in the plot, and illustrates Clark using his X-ray vision to check out everyone in the newsroom in a novel way. It doesn’t exactly save the scene, but it’s a joy to look at. Action Comics #1006 is good, but it’s too little, too late at this point. The reveal at the end of the issue could lead to some interesting developments, but it’s something long time readers have seen before and it’s hard to see how it will really affect the plot. Sook’s art is the highlight of the book, as it’s been on every issue he’s drawn, but that doesn’t make up for the legacy of bad decision Bendis has made on this book. It’s a shame, too, because this is a well paced enjoyable read, but this story arc is already so tainted that it can’t really save it on its own.